Dr. Barbara Greenberg, PhD, is a teen, adolescent, child and family psychologist licensed in Connecticut and New York. After 21 years of running an inpatient adolescent unit at a private psychiatric hospital in New York, she moved on to private practice, consulting work, writing and television. Her practice is located in Fairfield County, Connecticut. Dr. Greenberg is smart, savvy, and passionate about helping people of all ages. Teens and parents love her. And, of course she loves working with them. The audiences love her energetic, informative and fun style. She frequently consults and partners with news networks, television and TV producers in Connecticut and New York on topics such as parenting and adolescence. She also blogs regularly about lifestyle and relationships. The concepts behind Teenage as a Second Language: A Parent’s Guide to Becoming Bilingual are a culmination of hours of professional experience and collegial chatter between Dr. Greenberg and Dr. Powell-Lunder. From early on in their respective careers, they perceived themselves as students of adolescent language and behavior. 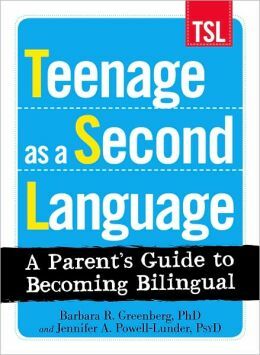 Purchase your copy of Teenage as a Second Language: A Parent’s Guide to Becoming Bilingual by clicking here.